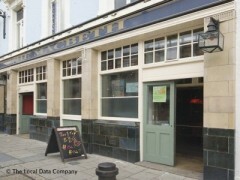 About: The Macbeth is a big old tumbledown pub in Hoxton. It now has a roof terrace. And a rather nice sound system. Supporting some of the finest new acts in the UK and the world as well as hosting some of the biggest bands on the planet. With nights ranging from the sublime to the divine. Amazing bar staff, wonderful security and cheap drinks! When this week’s latest indie-pop outfit gets a bit too much, escape upstairs to the terrace up top. The Macbeth may be more synonymous with the sweaty swagger of bands but on the roof there’s a way out – of you can handle the smoke. "If these walls could talk…"
Red Lion Road isn’t the most inspiring of London streets and stumbling across the haggard Macbeth façade might not lead you to believe there’s any reason to change that opinion. However, knock on that door and step inside and prepare for opinions to change as this spicy venue and pub shows you what it’s got. A right pile it may be, but over the three floors that it uses there’s enough going on to make whoopee for three venues. The roof terrace is a good addition to the Macbeth’s fairly tawdry reputation where fresh air meets not such fresh air as smokers take over what is one of the few rooftop spaces in the area. A level down and you’ll find the serene second level where it’s okay to come and get away from whatever manner of shenanigans is going on in the main room. Sparsely decorated and occasionally covered in local artwork, it does the job. Now, trumpets please!! THE MAIN ROOM! It chills to the bone – if these walls could talk… Over the years the Macbeth stage has hosted some huge acts and if you’re interested in supporting your scene then this is the place to come. Live bands play regularly and DJs take over the excellent sound system in between. Cheap drinks on the bar, excellent music and a fun crowd make this a hot ticket – and there’s even a pool table. Nowhere beats the Macbeth for its grimy glamour these days. Trashy sovereignty holds sway. Avoid this place if you're thirsty. Great for music. Terrible for a good bar experience. If you think arrogant, customer-is-wrong attitude is fun then go for it. I'll be back for the music but will NEVER use this bar again. Hi there, are you the couple who had an issue with the frozen marguerita? If so I do apologise for the mix up you guys had and the response the gentleman who served you and the lady supervisior gave you. Bar work and public service can be stressfull at times and sometime people aren't at there best, however they should always try and stay professional, but also if you are the guys I'm thinking off I personally came and offered you a replacement drink and you said you'd be happy with a couple of shots of jack Daniels, and you seemed satisfied at that point no? If you still feel short changed please feel welcome to come back and I will sort you a couple of drinks on the house to apologise. You cannot fault the Macbeth for the sheer range of music it offers. The venue is damn prolific. Come at the weekend and you're as likely to find an indie night as a trap/hip-hop party. Pitch up during the week and you're likely to see an up-and-coming band for peanuts. Love this place, plus the roof terrace is great for summer drinks and there is a second floor bar where you can escape the noise of the ground floor gig venue/club. its so good here, the new night they have called adults is really fun, and its free to get in which is even better, the bands that play are really good aswell. the macbeth is amazing! had some of the best nights ever there, especially bronze club that is hosted by golden silvers, such a good atmosphere and good music. i love it! Great atmosphere, decent beer price and amazing live music venue especially on the Dead by 30 nights. Hats off to the staff and promoters. Why haven't I been here before? It's obvious that this funny old boozer was never meant to host the trendy music and the fun crowd that queues for entry - but somehow it works. There's a roof terrace as well as a lounge and a lot of building work seems to be going on at the moment. The word was that the loos (pretty awful) were being improved to be as good as the rest of this great place. I was told that a lot of the young and famous appear but there was no-one I recognised when I was there. I like the sound of some of the other nights they have but don't everyone rush here though as I don't want to be on the end of the queue and miss the party. Wow, what a find, just a short walk from Hoxton Square, I thought i was walking into a normal pub but had the best night out ever. There was an amazing band playing on the night I went, and for a change the trendy crowd were really friendly and everyone seemed to be out to have a good time and a dance to the band and dj's. If you want a break from the music there is a little cosy lounge to relax in upstairs. One other thing I noticed was how nice the bar staff were and the door price was more than reasonable.